Upon hearing this, Zan immediately thought of his mother’s safety. He took his pole and rushed to his yard. The tiger was just coming out of the yard with his mother in its mouth. Using all his strength, Zan beat the tiger with the pole. The yard was so narrow that the tiger could not turn its body with a person in its mouth, and neither could it fight back. 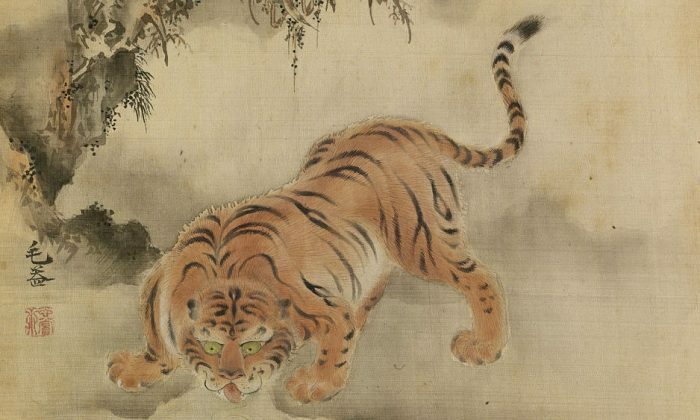 The tiger received heavy and repeated blows from Zan. Finally, it put his mother down and turned to attack Zan. At that critical moment, the county official sent more brave men to help, and they killed the tiger with arrows. Zan and his mother were saved from this disaster. The head of the county knew that Zan was very frugal, and filial to his mother. He saw it with his own eyes when Zan fought with the tiger to save his mother. He praised Zan by hanging a banner on the front of Zan’s house. On the banner were two big characters that read “Filial Piety.” All the villagers were very happy to see it. His high moral standard had a large impact on the whole village, and everyone learned to have more filial piety from him.